It is replaced by the Datalogic PowerScan PDF. The PSC PowerScan PDF scanner can quickly and omnidirectionally read all standard 1D labels - there is no need to orient the scanner to the label. In addition, stacked 2D labels like PDF417, RSS and composites are easily read in a point and shoot manner - the scanner doesn't have to be oriented or moved over the label. With the PSC PowerScan PDF capturing a signature or other document image is easy. Photo quality images of any object can be captured indoors or out. 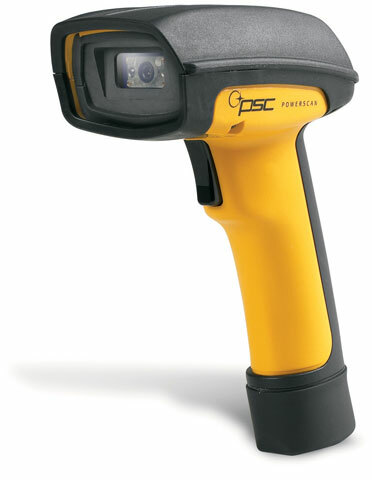 Two separate versions of the PSC PowerScan PDF are available to suit your specific application: the Standard Range (SR) model is well suited to most imaging needs and provides the greatest depth-of-field on medium to low density labels, while the High Density (HD) model is best for reading higher density labels like 6.6 mil PDF417. USB, High Density, 2D PDF417 Level Decoding - Color: Yellow/Black. Cable not included. See accessories. USB, Standard Range, 2D PDF417 Level Decoding - Color: Yellow/Black. Cable not included. See accessories. RS-232, High Density, 2D PDF417 Level Decoding - Color: Yellow/Black. Cable and power supply not included. See accessories. RS-232, Standard Range, 2D PDF417 Level Decoding - Color: Yellow/Black. Cable and power supply not included. See accessories. USB cable, 12 ft. straight, black. For QS6000, QS6500, QS2500, PS7000, MG1000i series.